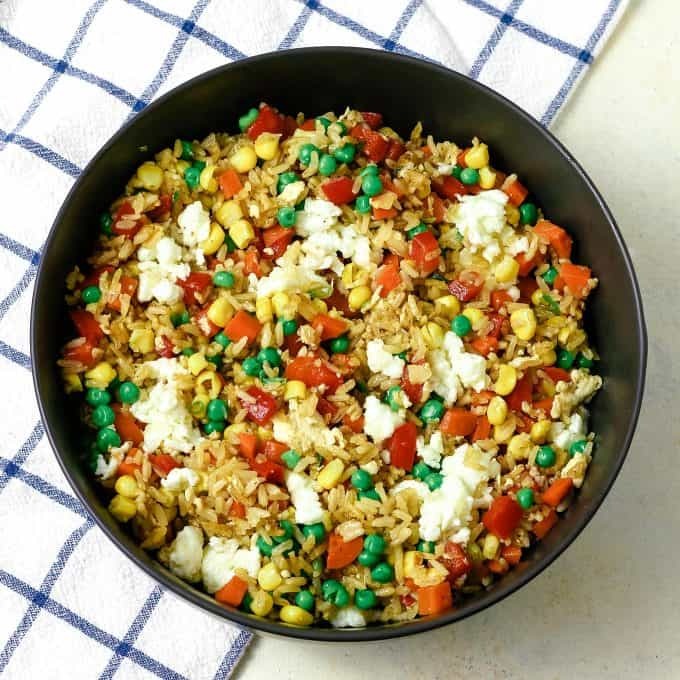 joy this vegetable fried rice when you are looking for an extra dose of veggies. It’s made healthier with brown rice and egg whites! During the holidays, I attend so many holiday parties. I feel like every day I’m eating dinners of appetizers and dip. You know how much I love both and I definitely don’t consider it a problem. That being said, I have to really think about what I am eating for breakfast and lunch. Since my nights are full of bread and cheese, I like to fill my lunches with vegetables. 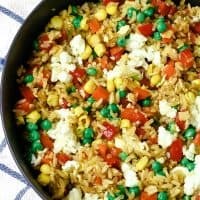 This veggie fried rice is just what we are both looking for! I was looking for a quick lunch fix last month and ordered some Chinese food with veggie fried rice. The rice was good but I knew I could make a better, healthier version at home. To make it healthier, I used brown rice and I piled on the vegetables. Also, instead of using whole eggs, I substituted egg whites. 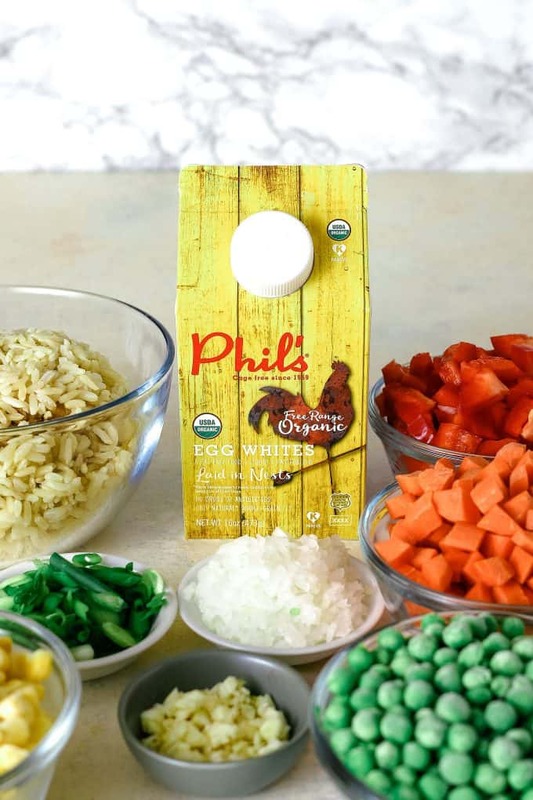 I always use eggs from Phil’s Fresh Eggs and I used their Organic Liquid Egg Whites (which are Certified Organic by MOSA) to make this recipe. When making this recipe, I highly suggest using a wok. You can cook in steps by pushing the food up on the sides. 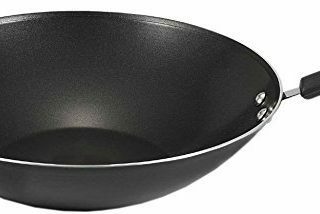 If you don’t have a wok, use the biggest frying pan you have. Before you begin, chop up all of your vegetables. You aren’t going to have time between steps to do any cutting because this recipe cooks so quickly. Heat vegetable oil in the center of your wok and add half of your precooked rice when the oil is smoking hot. Literally – you want the oil to be smoking. Toast the rice and then transfer it to a bowl. Repeat with more oil and the rest of the rice. Time to put all of the rice back in the wok. Leave a space in the middle and add more oil; then add your fresh veggies, onion and garlic. Stir gently. Add some low-sodium soy sauce and sesame oil and toss to coat. Or stir – I stir because I have a tendency to toss everything out of the wok. Season with a little salt and pepper. Push everything up the side of the wok and add the rest of your olive oil. Time to cook your egg whites! The egg whites are going to cook very, very fast so stir them quickly and scrape up anything the sticks to the wok. Stir everything together again once the eggs are cooked and add your frozen peas and corn. Continue to toss (or stir) until the vegetables are thawed out. 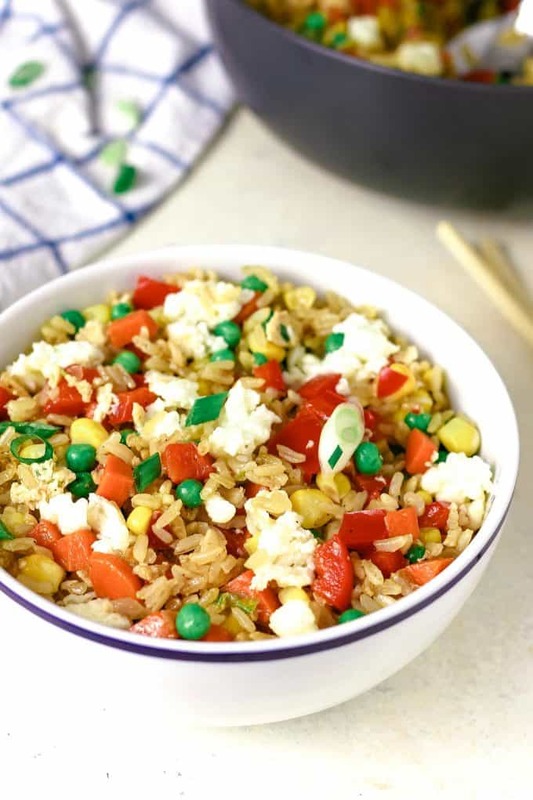 Enjoy this vegetable fried rice when you are looking for an extra dose of veggies. It's made healthier with brown rice and egg whites! Heat 1/2 tablespoon of vegetable oil in a large wok or frying pan over high heat until smoking. Add half of the brown rice and cook, stirring or tossing, until the rice is toasted (about three minutes.) Transfer cooked rice to a medium bowl. Repeat with another 1/2 tablespoon of oil and the remaining rice. Return all rice to wok and press it to the sides. In the space in the middle add another 1/2 tablespoon oil and the carrots, red bell pepper, onion, green onion and garlic. 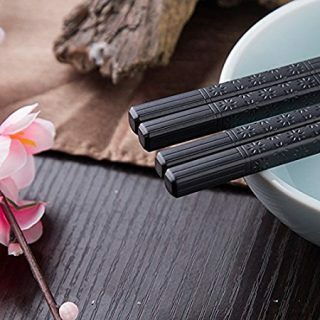 Stir gently and cook until soft and fragrant. Add the soy sauce and sesame oil; toss/stir to coat. Push the rice to the side of the wok and add the remaining 1/2 tablespoon oil. Pour the liquid egg whites into the oil. Stir quickly to scramble. Stir the egg and rice together. Add the frozen peas and corn and continue to stir until peas and corn are thawed. Season to taste with salt and black pepper. Serve immediately. This is brilliant with the eggs! I need to make this on Christmas for my veg daughter. But also a fabulous side dish! I’m dreaming of nights filled with bread and cheese….sigh. But seriously, this is exactly what I want for lunch! We love making fried rice!! And yes, eggs are always there too, I love that you’re using egg whites! 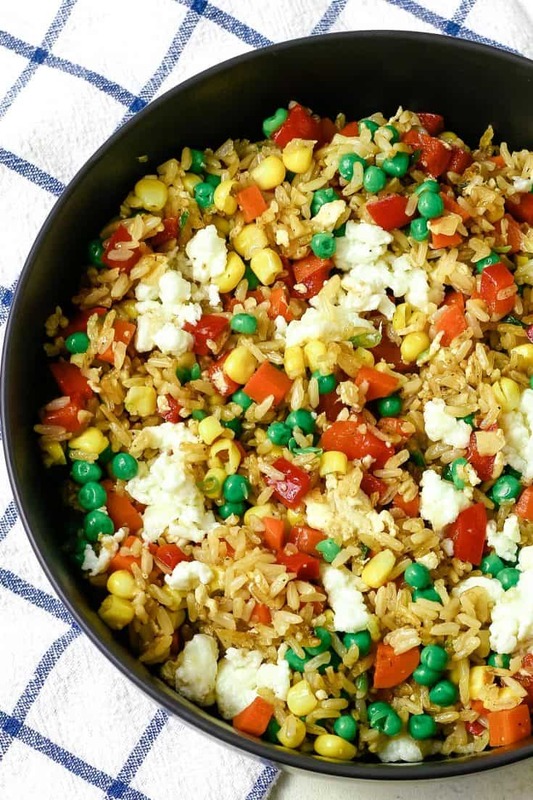 I’m sure this fried rice is absolutely amazing… can’t wait to try it! I love making it healthier! And that is something I definitely need after these holidays! 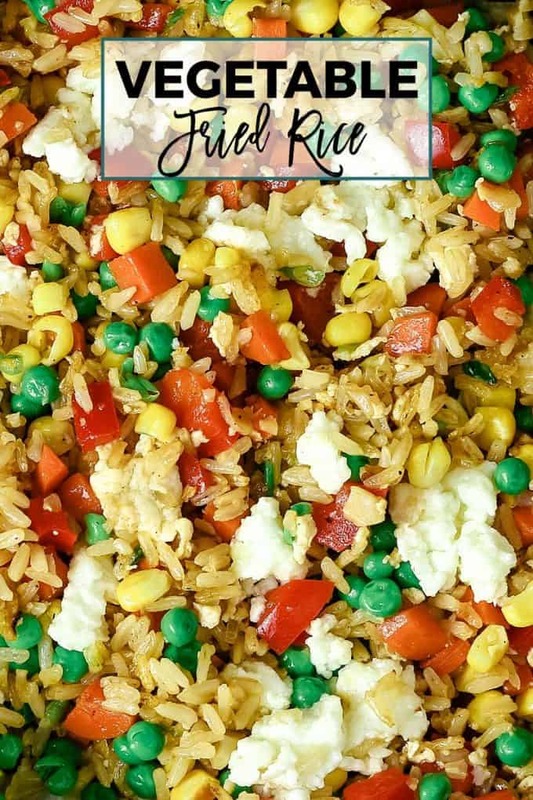 I love your healthy take on fried rice! It looks great. This looks so easy to make! I need to make this for our next Asian dinner night.